I was her wingman during our old soccer days. She played left forward and me, left midfielder. I met Janine when I was 14 on a soccer field in Corona, CA and before we moved to Georgia, she and her husband Matt moved to Tennessee. I was super excited that they were so close and we've stayed in great contact over the years. She is about to have her first baby in July and in the meantime has been fixing up some mighty tasty meals that make my mouth water every time she posts a picture. 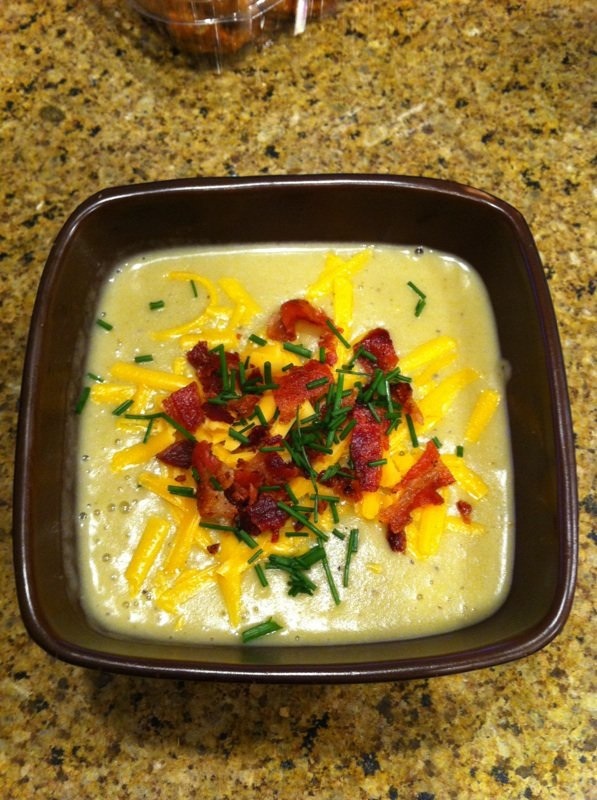 This recipe caught my eye because I love homemade potato soups! Perfect for a colder evening, this soup will knock your socks off! Put all ingredients in crock pot on the low setting (8-10 hour) -- don't worry! It'll be done in 6 hours. At hour 5 add a can of evaporated milk. Stir together and let cook in for 1 hour. Blend or serve chunky. Garnish with cheddar cheese, bacon, croutons, chives, whatever wets your appetite!